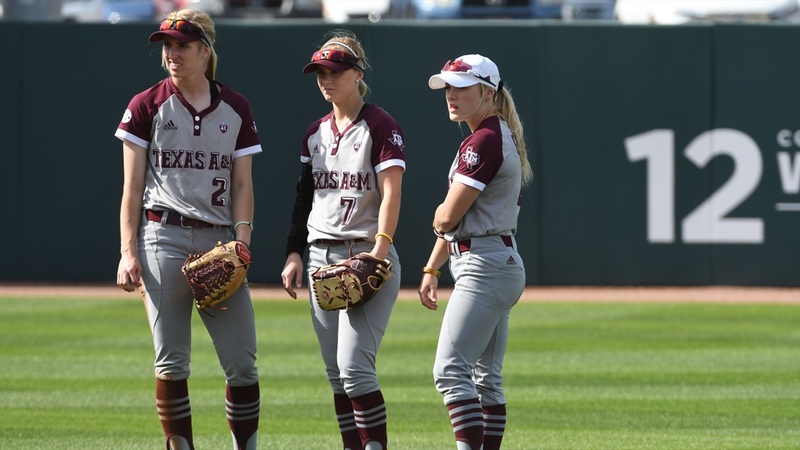 The Texas A&M softball team defeated the Lady Tigers of Texas Southern, 8-1, on Tuesday night. The game was the first of a doubleheader on Tuesday at Davis Diamond. The Aggies found themselves in an early deficit. After a quick walk, the Lady Tigers got on the board early as A’Leecia Bell rocketed a hit to left field that nearly cleared the fence. The RBI double would be the Lady Tigers’ only run of the contest. Texas A&M finally had their first hit of the game off the bat of Kayla Garcia. Garcia smacked a ball to right center to record a double. After a sacrifice fly to left field, Blake-Ann Fritsch brought Garcia home on a sacrifice fly of her own to tie the game in the third. Payton McBride continued her hot streak at the plate on Tuesday. The fourth inning would see the Aggies bats go to work. Two quick hits by Baylee Klingler and Payton McBride put two Aggie runners in scoring position with no outs. Following a foul out by Riley Sartain, Haley Lee gave A&M their first lead of the game on a RBI sacrifice fly to deep right. The Aggies would not look back. The would continue to add runs as the game went on, plating another run in the fourth and two more in the fifth. Smart baserunning by Madi Jatzlau was a major key in the fifth – Jatzlau would steal second, and a throwing error by the Texas Southern allowed her to advance to third. The Aggies added three more runs in the sixth thanks to a trio of singles by the bottom of the Aggie order. Texas A&M led 8-1 heading into the seventh and final inning. Kayla Poynter (3-5) started today’s game and went all seven innings. allowing only three hits, two walks, and a single earned run in the first. She shut down the Lady Tigers all game long and earned the victory after finishing the Lady tigers off in the seventh. Poynter would earn her fourth win of the year with today’s decision. The Aggies finished the first game with five sacrifice flyout RBIs, their most ever in a game, breaking the record previous record set in 2009. OK, so what about game 2?